With quiet concentration a woman pours milk into a bowl. With her left hand she supports the can she is pouring from. 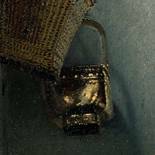 Around her are various objects: a loaf of bread, a stoneware jug, a basket and a brass bucket. The woman is standing near the window so she can see what she is doing. The light falls on her hands; her silhouette is dark against the white wall. There is a fascinating play of light and shadow in this painting. This is one of Johannes Vermeer's genre pieces in which he establishes an intensely intimate atmosphere. Although the artist observes his model from nearby, she continues with her work, totally unperturbed. The lighting in Vermeer's Milkmaid is extraordinarily subtle. Light falls from the left through the window. Beneath and beside the window it is somewhat shadowy, but the woman is standing in full brightness. 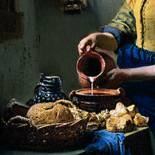 When you look carefully at the painting you see that Vermeer has introduced tiny points of light all over the canvas: on the edges of the jug and the bowl, but also on the fastening of her yellow dress, and on the bread in the basket. 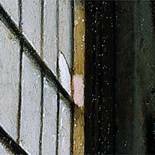 Vermeer paid great attention to details. He has painted tiny rough patches into the texture of the white plasterwork. 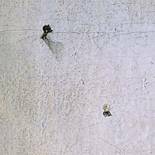 Also, he gives careful thought to a nail set high in the white wall, as well as to the light entering through a cracked windowpane. The structure of various objects is expertly rendered: gleaming brass and crumbly bread. Clearly, this woman is a servant and no grand lady. Her dress is simple. The blue skirt is tucked up to save it from getting dirty. She wears green over-sleeves which partly protect her yellow bodice. On her head the maid wears a starched cap. She looks strong and sturdy. Vermeer achieves this effect by painting her from a low viewpoint. This lends a certain weight and dignity to this simple and everyday subject - a woman at her work. Perhaps this painting by Vermeer is an embodiment of the virtue of Temperance. 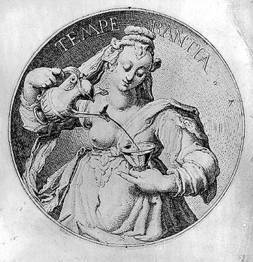 The image of a woman pouring out of a jug was sometimes used in this way in the seventeenth century, for example by Jacob de Gheyn II. Vermeer has carefully organised the space around the maid. This appears from the several overpaintings that can be seen using X-ray and infrared photography. Initially, Vermeer had introduced a painting behind the woman. There was also a sewing basket on the floor beside the footwarmer. In the final version of the picture all these objects were overpainted. The background became less cluttered and the composition was thereby clearer and stronger. The Kitchen Maid is built up along two diagonal lines. They meet by the woman's right wrist. 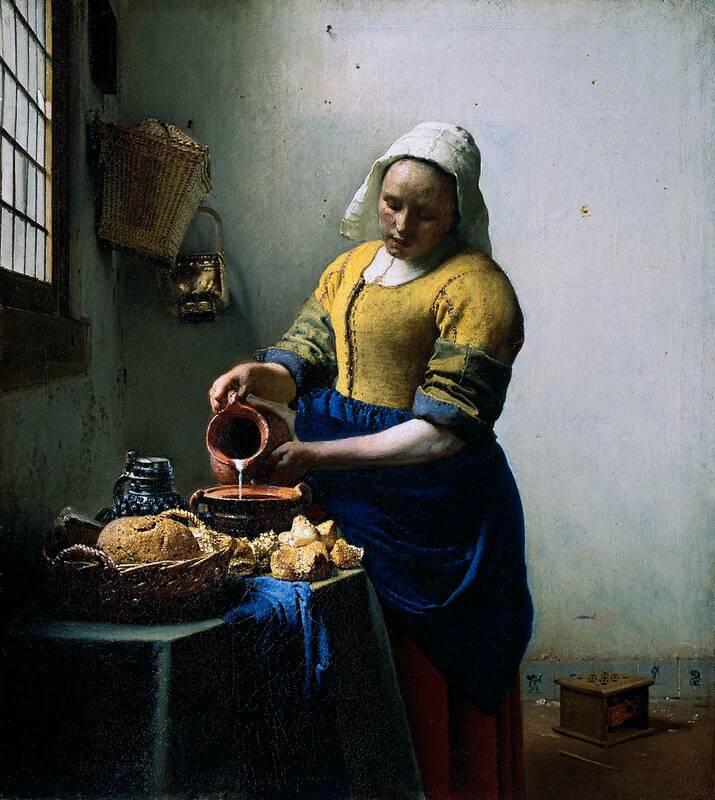 With this trick of composition Vermeer focused the viewer's attention on the act of pouring out the milk. Vermeer's Kitchen Maid was highly appreciated at an early date. 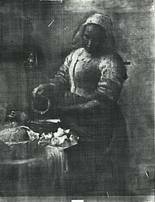 In an auction catalogue of 1696 the painting is described as follows: A Maid pouring out milk, exceptionally good. The Milkmaid , as the painting is commonly called, was sold for 175 guilders at that auction - a large sum for those days. At the beginning of the twentieth century the painting arrived in the Rijksmuseum. The Rembrandt Society bought the work together with 38 other paintings, thereby saving it for the Dutch public. There was a heated discussion both about the quality of the 39 paintings as well as the price - 750,000 guilders. 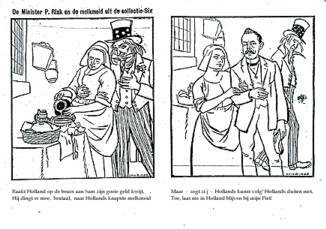 Many satirical cartoons were published in this connection. Today the painting is unquestionably one of the museum's finest attractions. Stoneware is made of clay that produces a grey or brown color and is fired at a temperature of around 1250 degrees Celsius. It is exceptionally hard and only slightly porous. Moreover, stoneware does not acquire a taste and is easy to clean. It is therefore an ideal material in which to preserve liquids and from which to drink. Around 1300 stoneware acquired something of a mass market and remained popular until glass and delftware took its place in the 17th century. Sixteenth- and 17th-century stoneware is often decorated with reliefs. One of the centres of stoneware production was the area between Cologne and Aachen in Germany's Rhineland.